Portable shotcrete concrete machine is designed to be portable, easy to be operated, the most important is that cheap. Industrial shotcrete concrete machine version, compared to a typical industrial spray machine will cost you about $10000 to $19000 this is a very expensive, especially start construction companies or developers. On July 8th, a Kuwait customer sent us an email to investigate the shotcrete machine price in Kuwait, after confirmation of Kuwait customer requirements, we suggest that the GZ-9 diesel shotcrete concrete machine and shotcrete machine price. The Kuwait shotcrete concrete machine customers are very satisfied with our shotcrete concrete machine price and place an order. 1. Artificial soil seeding for no soil surface, such as rock, sand, and for no fertility soil surface. 2. Shotcreting for tunnels, hydro-power engineering, mines, underground engineering, civil engineering and slope stabilization, etc. 3. Refractory spraying and repair for industrial kilns or kilns’ inner liner. 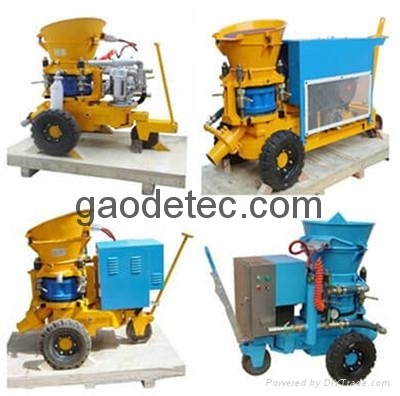 If you are interested in or need GAODETEC shotcrete concrete machine in Kuwait or want become our shotcrete machine agent in Kuwait, please contact info@gaodetec.com freely for more detailed information. Looking forward to your joining!